WHIZ AM has a long history of broadcast. We have been serving the area for over 3/4 of a century. AM 1240 is a 1KW station that serves Zanesville and Muskingum County, as well as reaching into the surrounding counties. 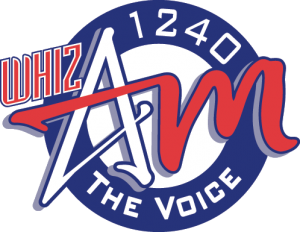 AM 1240 has undergone several significant changes in the past few years. The most recent was the construction of a new tower site. This site was needed in coordination with the building of the WHIZ-DT transmitter site. For almost 50 years, AM 1240 was housed on the same tower as our TV station. In order to build a new transmitter facility with a new tower for our TV stations, it was necessary to first move the AM site to another location. During the conversion of operation to the new site, transmission was maintained from the old site using our auxiliary transmitter. When the new site was completed, operation was switched to the new site, and then the auxiliary transmitter was moved to the site. Our main transmitter is a solid state Harris SX-1A that was purchased in 1986. Our auxiliary transmitter is a RCA BTA-1S transmitter. It uses (4) 4-400A tubes, 2 as modulators and 2 as drivers. This was the main transmitter for AM 1240 until the purchase of the Harris transmitter. The studio for AM 1240 is built around a Harris Gold Medalist 12 channel console. Music and spots are on hard drive. We also utilize a 360 Systems Shortcut audio editor. DAT is the primary tape format used in the facility.